My name is Gary Muller and I'm from Frankfort, Kentucky. This is my fourth year of deer hunting and my second deer season of bowhunting. I have an Express compound bow, set at 65lbs. I'm fortunate to hunt on a large farm in Northern Franklin County, Kentucky that offers timber and pasture locations. This year, I decided to start early scouting -- pick a new tree stand location and purchase a trail camera. I went with a Wildgame Innovations IR4-C and started getting great pictures of deer. I read all of your magazines, as well as a few others, recorded all the shows and applied what I'd learned. I came across a great mature buck (11 points with a split brow tine and a small lobster claw drop tine) hanging out with a very young buck with a great developing 8-point rack. 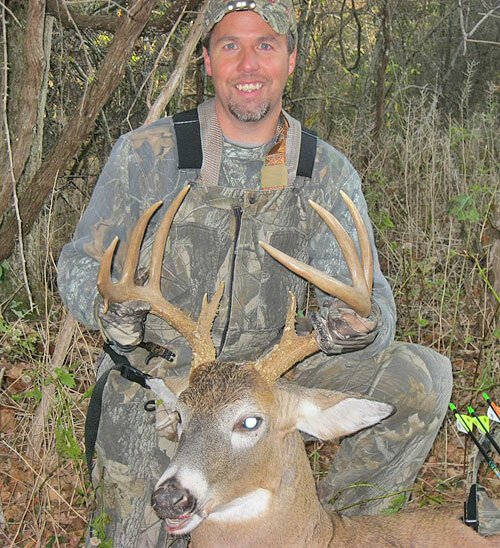 A few weeks later, God blessed me as I saw the same monster buck walking in toward my stand. I made sure my harness was secure, waited for him to quarter away, and at 28 yards he paused long enough for me to take a great shot. He ran to my right for 35 yards, stopped, and then fell. I was able to see him through the trees the entire time. The best part of this story is what happened next. My 20-year-old son Benjamin, had finally received permission from mom to go hunting with me during gun season. It was truely exciting to teach my son the love of hunting, to watch the world around you wake up with the birds chirping, squirels barking and the sun rising and wakeing all others. I purchased a youth Mossburg .243 riffle for him and he had lots of prior shooting practice with his .22 rossi single shot rifle. We watched nine does walk by from 40 to 60 yards. On the last weekend of gun season he spotted a buck, a big bodied five pointer that he shot perfectly. The deer went 20 yards, then rolled down the hill. Although we could see the deer from the stand, I walked my son to where he shot it, followed the blood trail to the deer, where he could claim his prize. His giant smile was exactly how I must have looked just 4 weeks prior, and I was so happy for him.